Many juicing critics lament that juices are too high in sugar to be healthy. They have a legitimate point, except that they haven’t considered low-sugar juices. It’s certainly easy to make a great-tasting juice with gobs of sweet fruit, but let’s face it, sugar is sugar is sugar. Unfortunately, it has the same effect on our bodies whether it is from fruit or candy. Of course, certain fruits do have highly beneficial properties and nutrients that make them helpful in juices, but definitely in moderation. And the sugar grams can stack up shockingly quick to around 30-40 grams in one serving with just 2-4 pieces of fruit! That amount of sugar can wreak havoc and suppress the immune system, in spite of the other health benefits or nutrients it can offer. 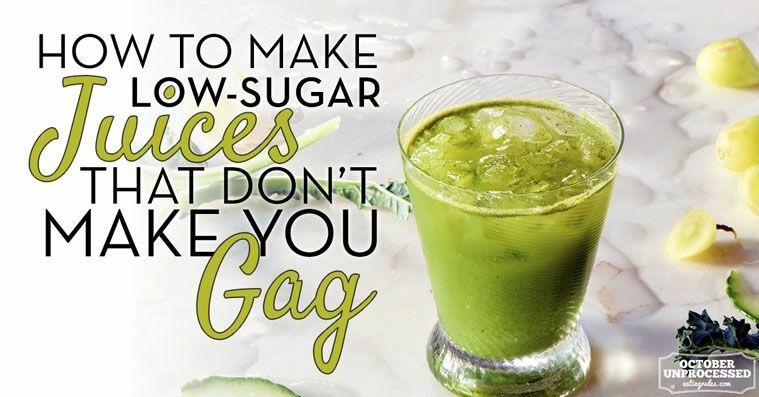 You may be acutely aware of this potential pitfall and maybe you have tried an all-green juice to avoid the sugar and found that it was, well, simply disgusting. 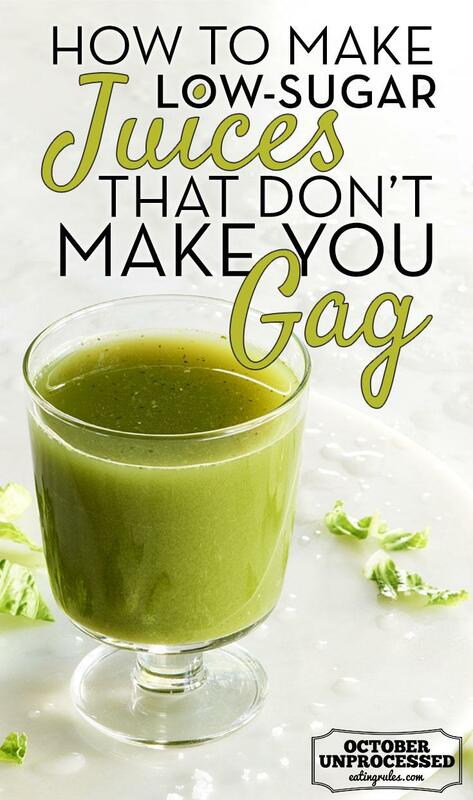 Just as it’s easy to make a great tasting sweet juice with loads of fruit, it’s even easier to make a truly gag-worthy juice by throwing a bunch of greens into the juicer. Thankfully, there are delicious options that can both satisfy your taste buds and remain low-to-no sugar. You just need to know a few tricks. This is a staple! This baby not only contains no sugar, has a minimal impact on flavor, and creates loads of juice for a base, but it is a rock star of hydration and has great nutrients to boot! This is about as good as it gets, unless you have a cuke sensitivity or just hate the taste. However, in their defense, many people who have told me they don’t like eating cucumbers don’t mind them in juice at all. If you have tried them and truly need a substitute, I recommend zucchini. It won’t produce quite as much juice, but has many similar benefits. I like about 1/2 to 1 English cucumber (organic and unpeeled) per serving of juice, depending on what I’m mixing it with. This veggie has a stronger flavor profile than cucumber that some people love and others not so much. However, once again, people are often surprised how much more they like celery as juice even when they aren’t big fans of it in its chewable form. It is also no sugar and can help produce a decent amount of juice, while acting as a natural diuretic (say goodbye to extra water weight), providing loads of minerals and natural sodium (the really good kind!). Celery can be added into to any juice by adding 3-5 stalks with leaves. Straight up as a juice shot (3-4 ozs.) or with a little lemon added in, this can be a powerful tonic to help reset your adrenals and metabolism when consumed every morning for 2-4 weeks first thing in the morning. Note that this juice has a salty flavor due to the natural sodium. One of the few no-sugar fruits that still weighs in with plenty of nutrition super-powers. It’s alkaline-forming, is a powerful cleanser, and contains loads of Vitamin C. As a bonus, their tartness covers the bitter flavors from greens beautifully. Usually I recommend about 1/2 to 1 whole lemon or lime per serving (yellow or green rind removed, white pith intact). If you’re newer to green or low-sugar juices, spinach is one of the mildest-flavored greens to add to juices. Swiss chard is another one. All greens are great, but some can be bitter. Spinach is surprisingly tasteless while nutrient-dense and alkalizing. Start with adding 2-3 handfuls into any juice recipe. Do yourself a favor, and don’t start with a bunch of kale or cabbage, which have a much stronger earthy and sulphuric taste. These are nutrient superheroes and can obviously be balanced in a juice also, but work your taste buds up to them as you become accustomed to low-sugar juices. To try it, add 1-2 stalks or a couple of handfuls at a time to start. Romaine can also be fairly bitter. Save juicing broccoli for when you’re a real pro or lose your taste buds, whichever comes first. To cover up bitterness, add lemon, cayenne, ginger, a little sweetness (see apple below) a pinch of high-quality salt or dilute the juice with water. Sometimes, you simply need a little sweetness to balance the flavors of any juice. Granny Smith apples are not only the lowest-sugar apple, weighing in at about 10 grams of sugar per apple, but they also offer some great benefits such as balancing the digestive system and aiding cleansing. I try to only use 1/2 of an Apple per serving when my juice needs a little sweetness and tang. If you need more, you can add up to 1 whole apple. I would rarely add more sweetness than that to any given juice unless I was needing some specific nutrient from a particular fruit. Other low-sugar fruits include grapefruit, cranberries, and other berries. Notice these are not regular toxic table salts (another conversation!) but specific high mineral minimally processed salts that can not only mellow the bitterness in your low-sugar juices and dramatically improve their taste, but also increase the amount of minerals your body absorbs from any juice. This is one of my favorite tricks for tastier, healthier juices that I learned several years ago from my dear friend Tess Masters, The Blender Girl! A little heat from a small pinch of cayenne added to any juice, or from juicing an inch of ginger root or a 1/4 of a fresh jalapeño always adds a nice touch that cancels some bitter flavors and adds a metabolism boost! I personally love a little pinch of cayenne added to any juice and often add hot peppers in my juice at home. Let’s be real. Some days, you just don’t have time to juice. In that case, the next best option is to buy your juices. Try to get organic, cold-pressed, non-pasteurized juices when possible. Also, look for the ingredients listed above in any juice and fewer fruits. My favorites are the Omega 8006 and the newer Omega Juice Cube. 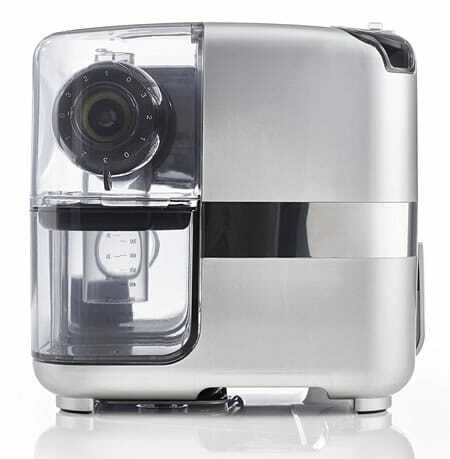 These are solid, mid-range juicers with great warranties and amazing versatility. Did I mention they’re easy to clean up also? Oh yeah. You really can have it all with juice. So there you have it. When you have time to make your own juices, here are some simple, delicious, low-sugar juice recipes. Go forth and juice with confidence! So simple and hydrating. If you're just starting out and need a little sweetness, add 1/2 a Granny Smith Apple. Reduce it slowly to just cucumber and lemon. Many of my clients love this one for its simplicity and to improve their skin, hair, and nails. You can add a handful of parsley (stalks and all) to try a slightly different, fresh herbal flavor that adds minerals and helps purify your blood. Just two ingredients - Yep, that simple! 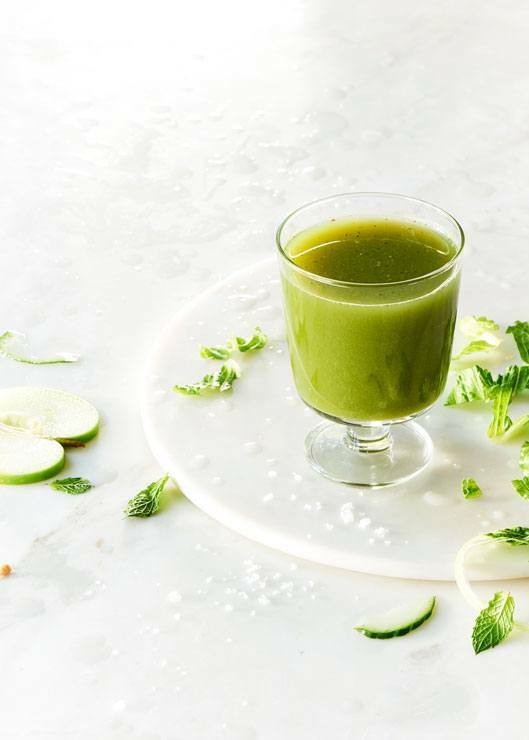 Recipe from my book with Tess Masters, The Decadent Detox Book: We love this refreshing green juice, like a crunchy chopped salad in a glass. Spinach, zucchini, and cucumber deliver masses of minerals and alkalizing chlorophyll to oxygenate the blood and cells. A natural diuretic, celery helps with fluid retention, green apple cleans out the colon, and lemon breaks down toxins in the liver. Push the spinach, celery, apple, cucumber, lemon, snap peas, and water through your juicer. Stir in the apple cider vinegar, salt, and cayenne boosters, if using. Add a splash of apple cider vinegar for prebiotic punch, salt to bring out the flavors and further alkalize the blend, and cayenne to move your metabolism, encourage sweating to detox the skin, and spice up the party! This mellow green juice is fantastic for rebuilding the body with loads of minerals. Spinach and Swiss Chard alkalize and purify the blood and provide minerals. Cucumber hydrates cells and tissues and fennel adds a touch of sweetness without sugar. Lemon brighten the greens and aid digestion. Boost with ginger to warm the body, stimulate the lymph, and ease digestion, and a pinch of salt to meld the flavors and optimize mineral absorption. As a certified Holistic Health Coach (HHC), Karen Kipp, The Juice Goddess, enjoys a diverse career and is dedicated to empowering others in their unique wellness journeys via whole food, plant-based nutrition, juicing, and cleansing. She is the co-author of The Decadent Detox. For more than 20 years, she has been coaching and facilitating juice fasts, wellness retreats and cleansing programs, as well as fasting herself. As a former single mother, she understands the real-life schedule demands that many face. In that spirit, she strives to make optimal wellness attainable and accessible for everyone. Away from the juicer and her coaching practice, Karen loves her work as volunteer and board member for several nonprofits, as well as cooking, experimenting in the kitchen, gardening, loving on her huge extended family, and adventure travel. Join Karen on Facebook and Instagram. 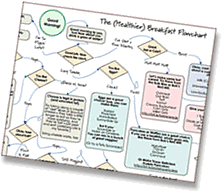 This is a great post with great recipes, thank you! I make smoothies often for breakfast, but it’s been a long while since I’ve made green juice. I am aware of its amazing healthful benefits, but I simply don’t have the budget and space for yet another kitchen gadget so I mostly buy juices at the store. Do you have any thoughts on blending veggies and fruits in a Vitamix and straining out the pulp? That’s what I used to do and I make sure I drink the juice right away. Also, have you heard of and/or tried the Vacucraft Juice Saver container? It uses a vacuum sealed system that keeps juices fresh for a much longer period of time than conventional containers so you can pre-make juices ahead of time to enjoy or keep for later. I just did half a bag of carrots, an apple and added some orange juice. It’s delicious! Those are all high in sugar (esp the carrots).. of course it’s delicious. Rather than juicing, please consider a whole foods drink. A powerful blender like a VitaMix will liquify the fruits/veggies and you get the benefits of the whole foods, rather than just the juice. Think of all the fiber and other important nutrients you throw away with the leftover pulp from just juicing. I don’t throw the pulp away. I use it to make other things like crackers and pb chewies! By removing all those things it gives your body a vacation from the hard work of digestion while getting the nutrients directly to your system. So there are benefits to both…depending on what you are wanting. How do you make crackers? And what are pb chewies. Thanks a bunch!